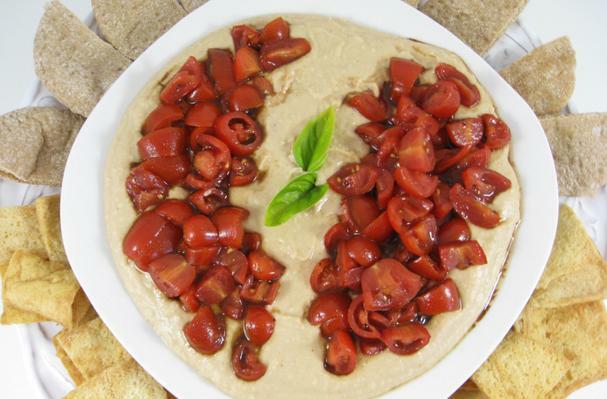 To prepare the hummus: In a food processor fitted with a steel blade, process the garlic cloves until finely minced. Stop the processor to scrape down the sides of the bowl. Add the beans, Tahini, lemon juice, water, olive oil, soy sauce, cumin, salt, pepper, cayenne and process until combined. Stop the machine and scrape down the sides of the bowl. Continue to process until smooth. Place the hummus in a serving bowl or plate. To prepare the Checca: In a medium bowl toss together all the Checca ingredients. Place the hummus in a serving bowl or plate. Arrange the Checca on top. Surround hummus with pita triangles and pita chips and serve. Store leftovers in the refrigerator. Shopping Tip: You’ll find Tahini (sesame paste) in the international section of most supermarkets. Trader Joe’s sells a variety of pita breads. We used their whole wheat. They also sell delicious bags of pita chips with sea salt. These are baked and contain 50%% less fat than regular potato chips. You’ll find these in the chips aisle. seasonings. My skinny version retains the same great taste but with a fraction of the fat and calories. I'm including a Checca topping just like theirs. This skinny dip has 116 calories and 5 grams of fat per serving. CPK’s has 225 calories and 17 grams of fat for the same serving size. That’s a big difference and you’ll love this recipe!